Workforce 2.0 is an event held for HR, Founders, first-time managers and CEOs to explore, learn, converse and understand creating and transforming a value drive workforce. Workforce 2.0 aims to bridge the gap what the workforce want and what the employees offer, and build awareness about building a well accomplished and engaged workforce that today’s organizations need. It will be held at CoWrks - Infinity, Bengaluru on 25th October 2018. 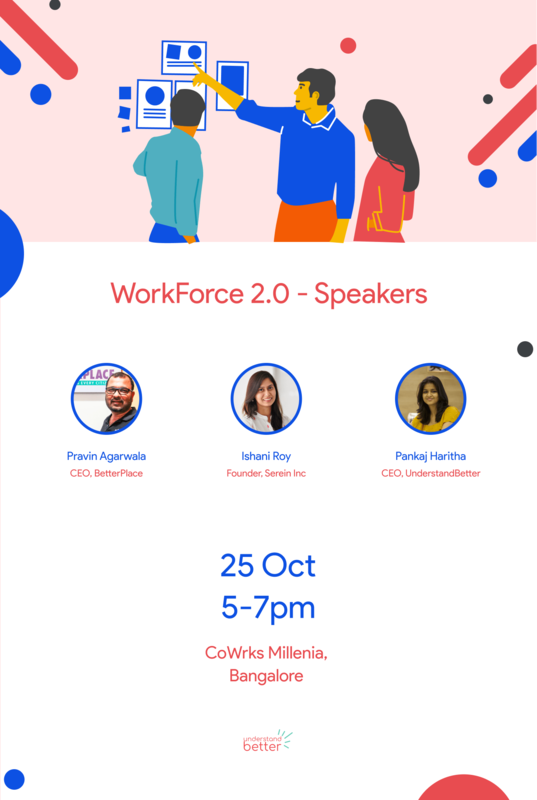 Understandbetter announces WORKFORCE 2.0 for HRs, founders, and leaders on 25th October 2018 at CoWrks - Infinity, Bengaluru. An event to explore, learn, converse and understand creating and transforming a workforce to deal with the challenges from technological, social, cultural and economic changes. WORKFORCE 2.0 provides a platform for founders and managers to share and learn from others about creating an organization of tomorrow. A new framework of how to build an engaged workforce driven by values and how to apply it in practice will be discussed. Though the pace and social connectivity of technology are very high, human connection has become poor. This leads to a serious threat to the organizational culture and employee engagement which is the most influencing factor in the growth and success of the company. Some of the notable speakers at WORKFORCE 2.0 will be Ishani Roy, Founder of Serein, Inc., A company that works with startups to implement practical diversity programs and Pravin Agarwala, Founder of BetterPlace. Pravin is an Industry Veteran and a Global Tech Leader who has led and advised numerous budding companies to grow successfully. WORKFORCE 2.0 will be a guide to success, especially for first-time managers. WORKFORCE 2.0 will cover the strategies for talent retention, creating a progressive and highly productive workspace, methods for preserving employee emotional well being, building a well-performing team and so on.